1. Set a course for the Company management to successfully manage, operate, and administer the business. 2. Inform grant providers, lenders and/or investors of the capital requirements being requested by the Company as well as its history, its projected future, and how the requested funding would give the Company the ability to add value to the local economy, generate tax revenues for local and federal government, and help put people back to work. [COMPANY NAME] (herein also referred to as the "Company") is a start-up business that was founded by [NAME] and [NAME] who have structured the business as a partnership. The management of the Company possesses the skills, talent, education, and employment background required to effectively direct the Company. The Company's vision is to provide the best possible combination of customer service quality, product quality, and price so that every customer feels they have received excellent value and is delighted to continue to purchase from the Company in the future, to be able to offer something for everyone, and to provide for the families of the Company owners. Based on the financial projections contained within this Business Plan, the future of [COMPANY NAME] appears bright. With the diligent efforts of management, the Company is projected to experience sales growth, profitability, and positive cash flow over the three-year projection period. Management has adopted a marketing strategy that is guided by the cost effectiveness of each advertising method and campaign. The Company's sales strategy is guided by statistical data which will be gathered on every sale and purchasing customer. A comprehensive financial plan that includes close monitoring of financial data, the use of professionals for legal, accounting and tax preparation needs, commitment in developing a strong banking relationship, and an exit strategy has also been adopted. 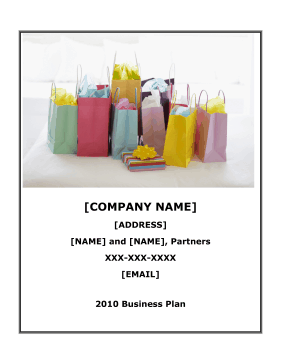 By following this Business Plan, [COMPANY NAME] has the opportunity for continued growth and profitability for many years into the future. The Company goal is to provide the finest in service quality relative to the price that the customer pays so that added value is realized each and every time. Its offerings include a gift shop, a coffee shop with baked goods, party rental items, fresh and silk flower arrangements, and candles. The Company will provide its offerings to the general public in [CITY], [STATE] and the surrounding residents of [COUNTY], [STATE]. The major focus for grant programs appropriate for [COMPANY NAME] would include those programs being offered to businesses that are 100% women owned and business that are expanding that will hire the unemployed.